Welcome to the future of FlexiSPY. Already at the forefront of monitoring software, we have now made it possible to purchase our products using the latest in digital payment method: cryptocurrency. That’s right, we have now added Bitcoin, Bitcoin Cash, Dash and Litecoin – four highly recognized and reliable cryptocurrencies – directly to our shopping cart. Oh, and we’ll give you an instant 5% discount for making a purchase. How Do I Make A Purchase With Cryptocurrency? Making an online purchase with Bitcoin, Bitcoin Cash, Dash and Litecoin is easy. Follow these steps and you will be able to protect your children and business with FlexiSPY in no time. Actually, FlexiSPY customers have been able to use cryptocurrency since 2014, years before it became such a mainstream topic of conversation. However, the previous process for making a crypto-purchase used Bitcoin and was time consuming – requiring Live Chat and many additional steps. 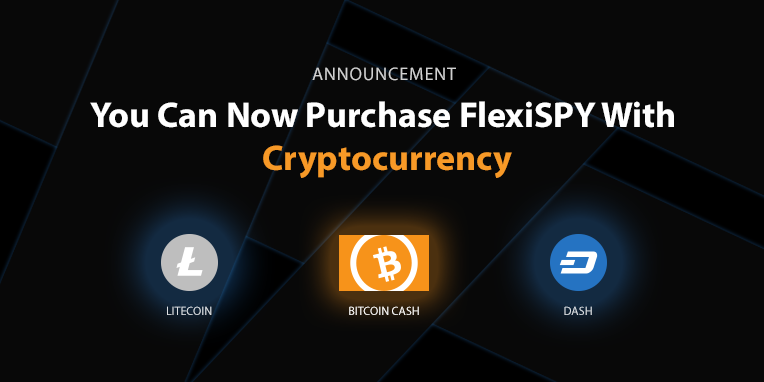 We have recently streamlined our process and updated the cryptocurrencies we accept, so that buying FlexiSPY with Bitcoin, Bitcoin Cash, Dash or Litecoin is as easy as using PayPal or a credit card. Plus, we’ve sweetened the deal by adding that 5% discount on any purchase made using one of our accepted digital currencies. According to Investopedia, ‘cryptocurrency is a digital or virtual currency that uses cryptography for security.’ More basically, it is a digital currency that is not regulated or controlled by any government, authority or private entity. Therefore, people are able to make trades, exchanges or investments without interference by a central body – thus reducing fees, increasing security and making it difficult to track transactions. This is exceptional from a security perspective, but can also lead to less than desirable uses (as seen with the rise of such networks as the dark web). However, as with any controversial or misrepresented product or technology, it is up to each person to use it responsibly. Hmm, sounds like something we’ve heard before. We are thrilled to offer even more options to our customers as we continue to strive to be the pioneers of our industry. But don’t worry, if you are currently more comfortable using traditional forms of payment, FlexiSPY still accepts credit cards and PayPal. Take a minute to look more closely at cryptocurrencies to see what the buzz is about – we see their value as payments of the future. Because, let’s face it, there was a time when the current ‘traditional forms of payment’ were seen as something out of a science fiction novel. Let us know your thoughts on cryptocurrencies. Are these something you use? Do you see them replacing current forms of payment in the future? Don’t forget to subscribe to our blog below to stay up to date on the latest insight and information from FlexiSPY and the monitoring software industry.